Burmese artist Aung Kyaw Htet is opening his new show Shades of Grey at Thavibu Gallery in Bangkok on Sat. 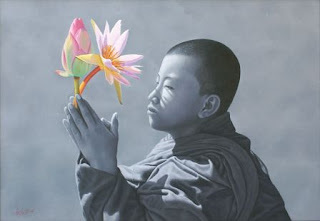 The devout Buddhist is famous for his colourful monks and novices painting. His grey paintings with a few touches of colors are more powerful than usual. They seem to explore the slippery social environment of Burma and the role of romanticism under such conditions.